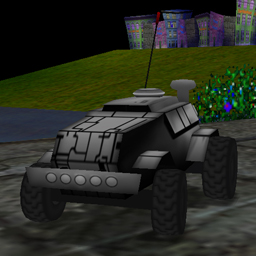 That's a fan-made car based on the Re-Volt gallery picture lib13a.bmp: An old concept of car made by Paul Phippen. This picture is only available in the Dreamcast version of the game. Please note that "APC L-13" is a fictitious name, not the real name of the car. *Fixed Center of Mass, body AngRes and springs Restitution.